Casterton, a rural town in western Victoria, is at the junction of several roads and the Glenelg Highway. It is 40 km from the South Australian border and 60 km west of Hamilton. 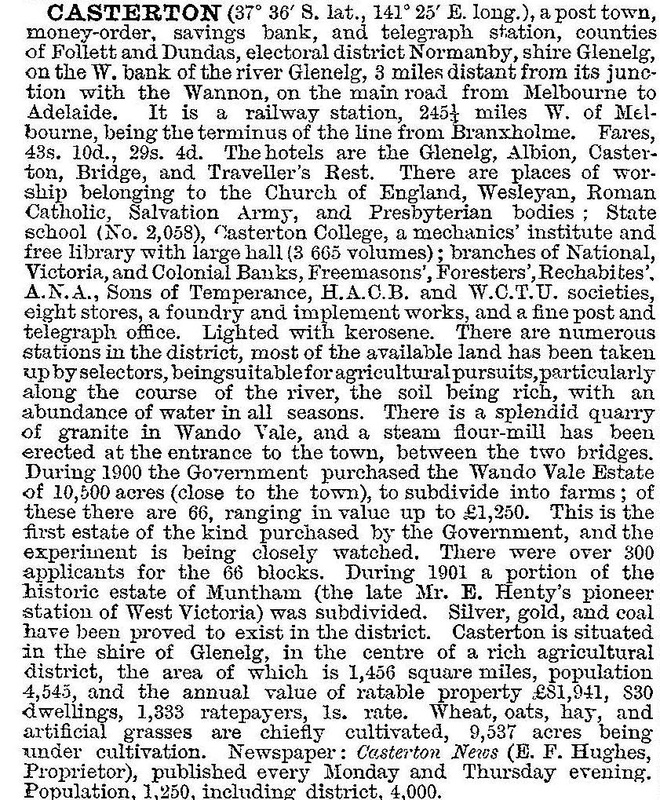 Casterton was the heartland of Thomas Mitchell’s Australia Felix. Mitchell, the New South Wales Surveyor General, travelled south-westerly, entering the Wando Valley and crossing the Glenelg River near Casterton. He then saw the Wannon Valley east of Casterton, describing all the land as containing excellent soil and grass, surpassing in quality any he had seen in New South Wales. When Mitchell encountered the Hentys in Portland he told them of his discovery. Francis Henty settled at Merino Downs, south-east of Casterton, in 1837. By 1841 the land west of Casterton was under pastoral runs and the land east of Casterton was taken up by 1844. Warrock, with a particularly fine and complete series of heritage listed farm buildings, was first occupied in 1841. It is north of Casterton. In 1842 or thereabouts, the Glenelg Inn was opened at the river crossing. Ten years later the town of Casterton was surveyed, and the name is thought to have been inspired by Casterton, in Westmorland, England. By the end of the 1850s Casterton’s population was about 150 people, but during the next decade its population more than doubled. In addition to the Anglican church (1857), Presbyterian and Anglican churches were built (1865-66) and there were a court of petty sessions and the Glenelg shire office (1866). The Casterton racecourse began in 1861. Another, and larger, closer settlement scheme occurred during 1900-10, creating about 100 farms. A hospital was built in 1908 and a higher elementary school was opened in 1915. Mary Gilmore lived in Casterton during 1907-12, getting her start by writing the Women’s Page for The Bulletin. After World War I some of the remaining estates were subdivided for soldier settlement, and this was repeated after World War II. Several of the pastoral homesteads and/or outbuildings have survived, notably Merino Downs (stables), Runnymede (homestead), Roseneath (homestead and garden) and Warrock. The last comprises 57 timber buildings, the earliest dating from 1844. The whole of the site is registered for heritage purposes and is open to visitors. Dunrobin and Muntham homesteads are also registered. Since the 1960s Casterton’s population has declined as its sheep and wool production has encountered shrinking markets. Casterton has State primary and secondary schools, a Catholic primary school (1902, 1958), a hospital, Anglican, Catholic and Uniting churches, a nursing home and a community centre in the old courthouse. The Casterton town hall (1937) dominates the main street. There is also a tourist information centre, and a museum in the heritage registered railway building. Casterton has two hotels, two motels, a shopping centre and a caravan park. On the periphery of the town there is a showground, two reserves, facilities for swimming, tennis, polocrosse, bowls and croquet, and further out there are the racecourse and the golf club. The railway line was closed in 1977. The Casterton News is published weekly. Casterton holds an annual Australian Kelpie dog muster. An early, perhaps the first, evidence of Kelpie breeding was a litter born on Warrock station in 1872. The litter was possibly a cross between a Collie dog and a part/pure dingo. In any event, the Kelpie had an advanced stock-mustering instinct and great stamina as a working dog. In 1994 the Glenelg shire was expanded southwards and the administrative centre was moved to Portland. Casterton retained a service office. In the shire centenary history (1964) there appeared a multi-fronted modern ‘departmental store’ in Casterton, built by storekeeper, Stanley Stookes. Much of the town’s solidly built infrastructure and private buildings retain the look of their period.